Discussion in 'Traditional Folders and Fixed Blades' started by Corso, Apr 15, 2019. Trying to decide which current production CV slimline trapper to get. I'm torn between a Yellow Bearhead Trapper and a one in Dark Red bone. Bone tends to be heavier than Delrin, it might be more grippy but never had a problem with the Yellow delrin ones. Corso and Frailer like this. Ive only ever had a yellow delrin one in stainless, so I dont have an answer for you. I like mine, and I like the light feel of it. If you want a heavier knife, theres an app for that, just get the standard trapper. Eli Chaps, Corso and WolfyW like this. I have both, I like them both, I prefer the bone handled one. 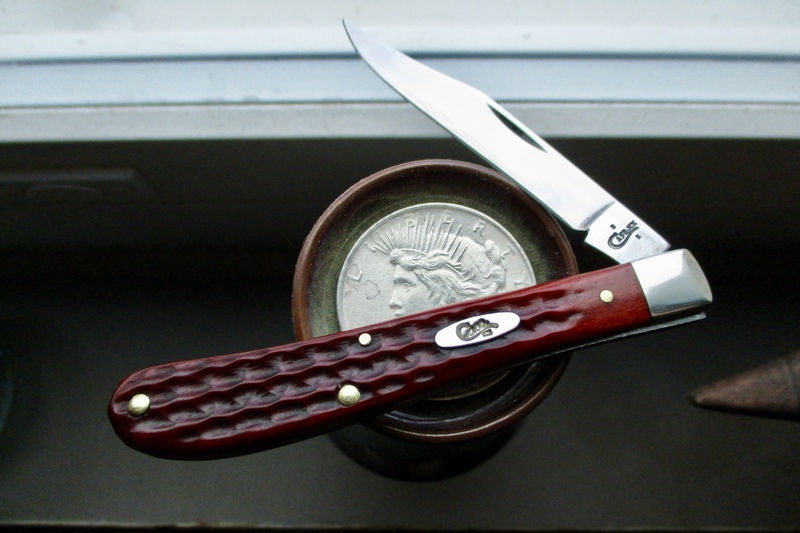 The bone on mine is fairly dark red and it goes well with the patina it has developed. I’ve never weighed them but I’m pretty confident the bonehandled one is heavier since it’s not a bare head model. The bone probably is a little grippier. Both are great knives. They do make a single blade CV barehead delrin.. I have one..
realy whats the CA code? Reitwagen, jmh33, Grateful and 5 others like this. Important to degrease it before dyeing, use alcohol and don't touch the knife with hand(use gloves or paper) Brew up VERY strong Tea British/Irish style using black tea. 4 teabags in a small saucepan and only enough water-boiling-to cover the bags, add pinch of salt. Once cooled a bit, not boiling but still very hot, lower the knife in-rest it on 2 bags, place the other two over it to cover. Leave a few hours or overnight. Then wash with dishwashing soap under the tap. Don't be alarmed if the bone has bloated or a load of black crap comes out. Dry slowly on a towel do not use direct heat, radiator, blow lamp...etc The bone get's back to shape in a short while, wipe down with mineral or coconut oil. Done! Yes, I have swaybacks in both old red SS and dark red CV. They each have their distinctive characteristics and both are beautiful. Good choice!